During the student years, the person receives a great number of writing tasks. These are various types of college and school essays and each of them assists in the creation of certain skills. Compare and contrast essay is among top popular essay tasks as it involves the ability of the student to conduct a deep analysis of the investigation objects, find mutual and opposite characteristics. Giving such a task, the professors expect critical thinking, ability to find the similarities and differences, provide a better apprehension of the comparison elements, reveal their connection to each other, etc. Such assignment greatly benefits analytical skills level growth which will be of great help not only while studying. Compare and contrast Nazism and Fascism. Shakespeare’s “Othello” and “Macbeth”, what makes them similar and what is different. Describe Lincoln’s policy against Roosevelt’s. Compare traditional play and poem literary styles. What are the benefits of each? Which is more acceptable? Select some feeling (love, jealousy, anger or envy) and analyze how they are described in two Impressionistic works. Students who work and those who only study. Who gets a better life experience? In what way different philosophers describe the sense of existence. The primary goal of such a history essay is not only to define common or different characteristics of subjects. A high-quality work will also provide the reader with a powerful argument helping with a better understanding of the depicted elements. The first attempts in developing the compare and contrast text might seem quite complicated, although after some efforts and training are applied, you will write an amazing work. Look for the research samples of similar type, but which have some substantial differences that can hook the readers. For example: American football and rugby (both are sports involving the usage of the ball, but there are a lot of differences like a number of players, rules, a shape of the field, etc.). You can choose two objects which don’t have anything similar at the first look, but after a more careful analysis, you may find something in common. The following examples illustrate the situation: watermelon and pumpkin (the first is considered a fruit, while the second is a vegetable, although, in reality, they both are berries), psychological difference between a boy and a girl, etc. You can also define an option of selecting the objects which look quite similar, but in fact, have some differences. For example: The Lord of the Rings: the movie vs. the book, both tell the same story, although the book gives an abundance of details in comparison with the movie. Mind that the objects of comparison should be of a great value. It shouldn’t just point at some aspects which are common or some points which are different. This type of text is expected to show the reader the value of the result that was achieved during the comparison of these two subjects. For example, what new can be learned by comparing the objects in contrast to analyzing them separately? Try to answer the simple question: “So what?” while writing the essay. In other words, what is the aim of comparing these two objects? Look for ideas by brainstorming. Of course, it is difficult to start writing the effective essay once you received the task. Have some time to look for ideas. Think of what is different and what is the same, what characteristics are major and what are minor. This will help you develop the thesis. Use “Venn diagram”. It’s a great tool when one needs to find differences and similarities in several objects. These are the circles every of which represents the differences of the objects with the common room for similarities. It’s really an effective way of visualizing your thoughts. It is also a good idea to write down the list of all the characteristics of both objects. You can write down in a column all the features of the first object, and then, in the second column – characteristics of the second object. Finally, you can match similarities and underline the differences. Outline the main features. There may be really a lot of common and different characteristics, although you shouldn’t use all of them in your essay. Select only the main ones. If you compare tea and coffee, you will point out that both are excellent drinks with toning up characteristics popular among people (these are similarities). However, coffee contains much more caffeine than tea. That is why they have different influences on the human body. Some people are not recommended to drink coffee because it may harm if there have some diseases (these are differences). Contrasting points may help work out the thesis. For example, what is better: tea or coffee? Do the differences make coffee a less popular drink? Think about the thesis. There are various ways to write down a compare and contrast essay, but there is always should be an argument why it was good to compare these two objects and not some others. The reader should find some useful new info. Prove that one object is better than the other. For example, tea is safer than coffee as it has no precautions: you may drink it as much as you want, besides it won’t harm the organism if there are any health issues. Explain how the objects are similar and different. For example, Christianity and Judaism are both religions teaching about one world God, based on Old Testament and believe in angels and demons. However, Christianity states that Jesus Chris was a messiah who died for the mankind’s sins and will come back someday, while Judaism teaches that Jesus was God’s prophet, not God; besides Judaism refuses the idea of Jesus’s sacrifice. Point by point. This type means switching between the points. For example, first, you compare the prices of tea and coffee, then the amount of caffeine and the effects of the drinks on a human body. Using this type, you can provide the reader with a clear side-by-side comparison, although there is a risk of confusing the reader and losing the core idea while switching from one point to another. Subject by subject. Here you are supposed to describe the first topic and then the second. For example, you discover all the information about tea and then point out all the characteristics of coffee. The advantage of this type is that you can gradually discuss topic by topic or even discover one subject through another. However, the disadvantage is that the similarities and differences are not so evident as in “point by point” structure. First compare, then contrast. First go all the similar characteristics of two objects and then – all the different. It is quite a popular type of structuring, especially if you want to stress the differences. Although the reader won’t be able to see the differences at once, there will be similar features. Prepare the outline as it will help you have the structure to keep to. It doesn’t matter what the topic is, there should be the following paragraphs. Introduction. This is the first paragraph you will write. Here you should put down the basic information about the objects you compare and contrast. Also, don’t forget to indicate the thesis and tell what you are going to discuss during the intro sentence. Middle Paragraphs. This element is a very heart of your essay. You discover all the points in details. For accomplishing the task, you usually need three paragraphs, and that is the minimal allowed quantity of vital points. However, the number can be different under the impact of the topic and type of the structure. Remember that you must split all the proofs throughout the body of the text and issue it in small portions. Showing counter-arguments. The reader should be acquainted with some counter-arguments. That is the reason for an explanation why they are not considered for your scientific product. Conclusion. Here, you should sum up all the info you have provided earlier in the paper. Usually, it repeats the thesis but with more details and proofs as now all the characteristic peculiarities are known. 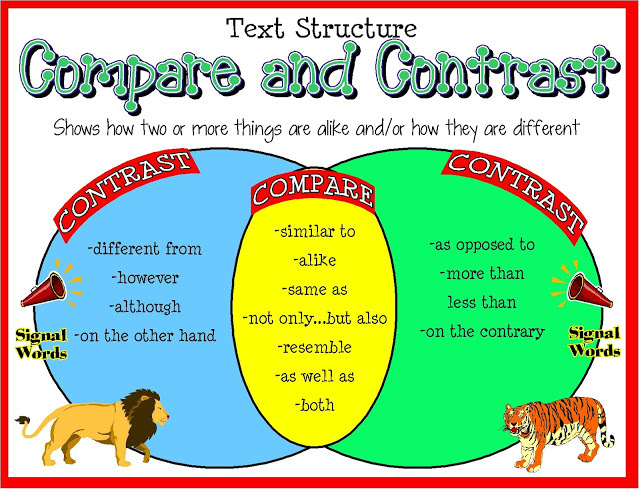 You’ve probably noted that creation a compare and contrast text appears quite an interesting task which involves research, comparison, contrasting, analyzing, etc. Mind that after you wrote the essay, it still needs to be checked for grammar and lexical mistakes. If you want to bring it to perfection, you can ask some of your friends or relatives to read it and tell their impression. Be sure: once you put enough efforts, your work will receive a good grade. get that kind of infⲟ in such ann ideal way of writing?